Every November and December, the news fills with reports about the United Nations climate change talks. The UN Framework Convention on Climate Change, UNFCCC, is one of two main international platforms where climate climate change impacts, mitigation and adaptation are addressed, the other being the Inter-governmental Panel on Climate Change (IPCC). The Kyoto Protocol and the Paris Agreement emerged from negotiations among national governments at the annual Conferences of the Parties, or COPs, of the UNFCCC, which is held in a different country each year. Left to right – Mark Terry, Idil Boran, Nancy Ghuman, Joanna Patouris. Photo: Nancy Ghuman. Each year since 2009, a delegation of York University faculty, students and staff have attended the annual Conference of the Parties, as civil society observers. 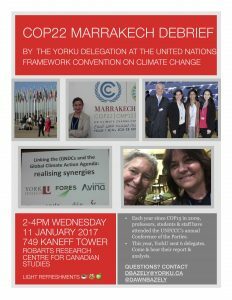 On Wednesday 11 January 2017, from 2-4pm, members of the York University delegation to COP 22 in Marrakech, Morocco, from 7 to 18 November 2016, will share their observations, and experiences. Please meet them in room 749 of the Robarts Centre for Canadian Studies, Kaneff Research Tower (see poster below). Joanna Patouris (L) and Nancy Ghuman (R). Photo: Nancy Ghuman. The UNFCCC COP doesn’t only bring together representatives of different countries. While the COP is primarily about international government negotiations relating to how to tackle the impacts of human-caused climate change, it is also a major research hub bringing together academics, think tanks, NGOs and the private sector to interact and create new research synergies through panels and workshops. Additionally, the COP hosts what is known as the “green zone”, a space open to the public, featuring industry trade shows featuring renewable energy technologies and innovations, electric cars, etc., and numerous cultural performances, art and film exhibits. As well, many indigenous peoples, artists, and environmental advocates attend. 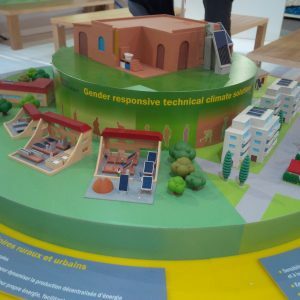 Exhibit about gender and water at COP22. Photo: Ellie Perkins. LAPS Philosophy professor, Idil Boran, headed the delegation. She was joined by Faculty of Environmental Studies professor, Ellie Perkins, recent MES graduate, Nancy Ghuman (above right), and current graduate students, Joanna Patouris (MES programme, FES, above left), and Mark Terry (PhD programme, LAPS). Western University Canada Research Chair in Watershed Sciences, Irena Creed, also joined the York University delegation. Professor Idil Boran attends her 5th COP. Photo: Idil Boran. Idil Boran (right) studies the ethics of climate change, and this was her 5th COP. 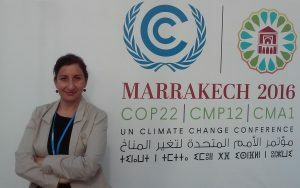 She held a side-event panel: Linking (I)NDCs and the Global Action Agenda: Realizing Synergies. The German Development Institute was the lead organizer, and the co-organizers included York University, the Free University of Amsterdam, Institute for Environmental Studies, FORES (a Sweden-based think thank), and Fundación Aviva (a Peru-based NGO/think tank). Idil also held a networking meeting for current and potential research collaborators. 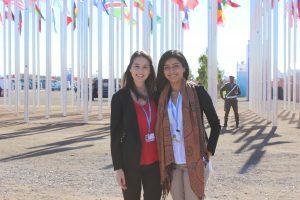 Ellie Perkins (below, left) last attended a COP in 2009: COP 15 in Copenhagen. Perkins, an ecological economist who specializes in water issues, has carried out extensive research in countries across Africa and also in Brazil, into how local communities may adapt to climate change. 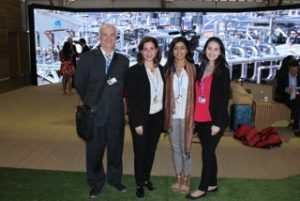 LAPS doctoral student in Communication Studies, and filmmaker, Mark Terry (at left in photo 2nd from the top), is no stranger to the UNFCCC. His films and his Youth Climate Report video platform for stories about climate change, have featured at both COP 22 and earlier COPs. His artist's statement about the project can be found here. 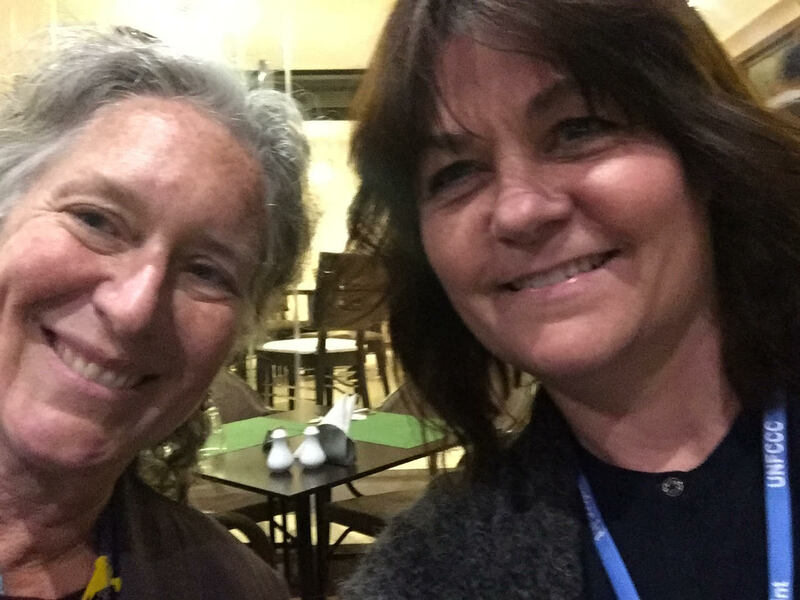 Ellie Perkins (R) and Irena Creed (L) at week 2 of COP22. Photo: Irena Creed. We were delighted that Professor Creed (left, on the right), a limnologist and Great Lakes expert, whose research examines ecosystem services and global change, could join our delegation. This came out of a conversation that Idil and Dawn Bazely had with Irena, at the United Nations Association in Canada’s Earth Day celebrations in April 2016, where we all presented our research. 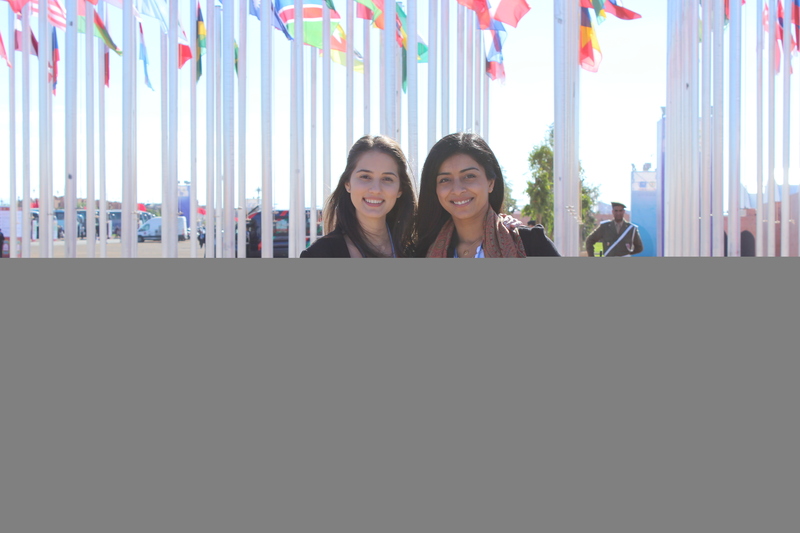 Both Nancy Ghuman, who recently graduated with her Master’s in Environmental Studies and Joanna Patouris were able to connect with and support the York University delegation's activities, while pursuing their own research interests at the COP. Nancy’s MES research examined the impacts of climate change on energy security. She explored the relevance of the European model of community energy for rural Costa Rica. Joanna, who attended her fourth COP, is conducting research on the challenges faced by developing countries in balancing their national development priorities and meeting their commitments made to the UNFCCC through their nationally determined contributions.. 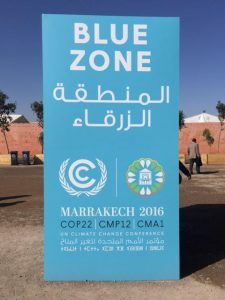 In order to attend the annual COP, members of civil society, which include university students and researchers, must be accredited by a recognized Research and Independent Non-governmental Organisation to the United Nations Framework Convention on Climate Change (UNFCCC), known as a RINGO. Access to this accreditation provides an excellent experiential education opportunity for outstanding, engaged students studying multiple facets of climate change. As readers of this blog know, I study the impact of climate change on invasive species, and the science-policy-politics nexus of climate change. In 2008, when I was director of the pan-university Institute for Research and Innovation in Sustainability, IRIS (2004-14), I applied for, and received observer status. One of the recommendations by the panellists at the 2009 Climate Justice conference organized by IRIS was to seek observer status at UNFCCC. 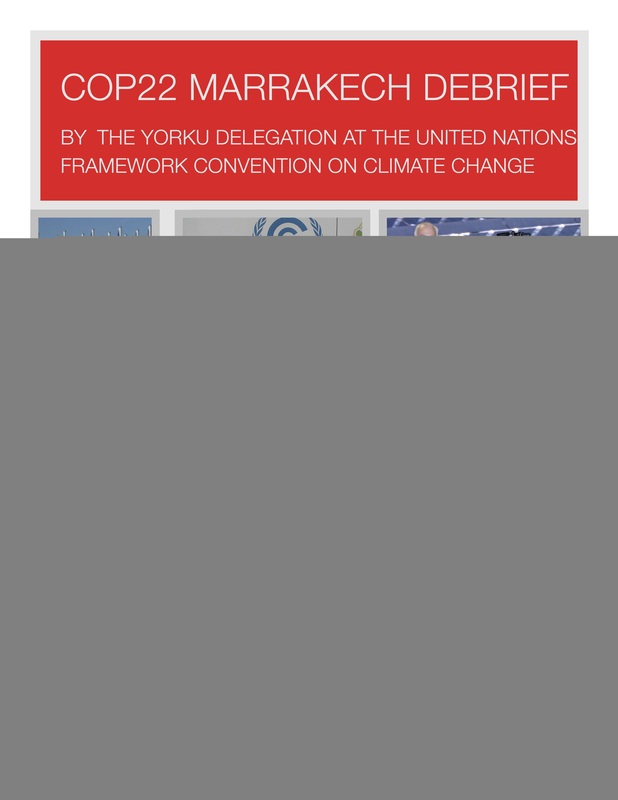 As York University’s Focal Point for the UNFCCC, I handle the annual accreditation process, which is lengthy, and begins in the spring of each COP year. I also screen numerous international requests, with the help of Ellie Perkins and Idil Boran, that I receive from academics, students, and members of environmental groups seeking to join the York delegation. Since 2009, I've learned that the United Nations is a pretty complex bureaucracy, and people interested in attending UNFCCC meetings should plan ahead by a year, and watch the website.